This page is a hub. 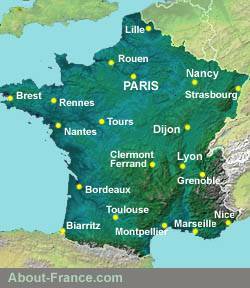 Use the links below to find information about different aspects of travelling to France or different ways of getting round France once you've arrived - with or without a car. Being about 1000 km from east to west and 1000 km from North to south, France is a large country by European standards, and one where tourism inevitably involves travel.... even if it's just a matter of getting there. Find more information on About-France.com. Return to About-France.com home page . ► Essential information on the different options available for travelling in France or travelling through France without a car. Travel to France and within France is easy, and relatively inexpensive..... France has an extensive network of regional airports, many of which are served by airlines from other parts of Europe, including many low-cost airlines; several French airports have direct flights to the USA or Canada, particularly to New York and Montreal. Within France, the main form of intercity public transport is the train , and the French TGV network of high-speed railway lines is one of the best in the world - and constantly expanding. By contrast, domestic air travel is relatively expensive except on some high-volume routes where the airlines compete with the trains. France has a well developed network of motorways and main roads; most motorways are toll roads - but you can find ways of avoiding the tolls on the pages about driving in France. In most of provincial France, driving can be a relatively relaxed experience, as traffic is light except around main towns and on the main regional roads. But there are tens of thousands of kilometres of minor roads that carry very little traffic: these routes are ideal for cyclists. Slow travellers can enjoy France not only thanks to its bucolic backroads, but also by using a developing network of cycle ways such as the French section of the Danube-Atlantic cycleway, which links the Rhine to the Loire, or the cycleways along many of France's canals, such as the Canal du Midi. Completely off-road, France has an extensive network of hiking trails, the longest of them running from the English Channel to the Mediterranean. A few more information pages to help you plan your trip.